I wish you could see the shimmer on the splendid cover by Tim Byrne. It makes a glimmering maze of thorns around Elizabethan calligraphy, snuffed candles and a single black snowflake. Some of the brambles have grasping fingers! A proper mix of dark and light for this story threaded through with despair and hope. Time slips between 1543, 1592 and some unearthly place . . . It is sinister, disturbing and gruesome at points – rightly so when considering the nature of evil. 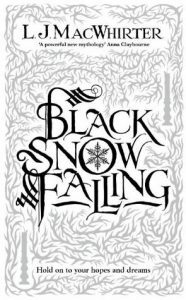 Despite the matching beauty of the cover and much of the prose, Black Snow Falling is not suitable for sensitive or easily disturbed readers. It will suit those who’d enjoy seeing the dilemmas of a spirited Elizabethan adolescent become enmeshed with far greater issues which spread across dimensions. Though it’s bursting with generous amounts of imagination, it’s a short read with lots of incident. To be flippant, I might say a bit ‘Dr Who with ruffs’ but serious points are made amongst the adventure. 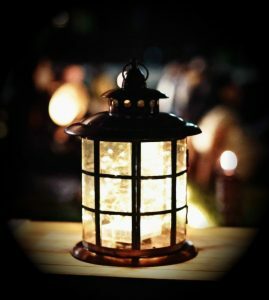 Whilst there is a lot of darkness (think ornate dark oak panelling), there is most assuredly hope glowing like a lantern. Watch out for the ‘Interesting Times’ UK Bookshop Tour: L. J. Macwhirter with fellow YA debut writers, Rowena House (The Goose Road) and Tracey Mathias (Night of the Party) – should be quite lively! This entry was posted in Review and tagged Black Snow Falling, historical fantasy, L. J. MacWhirter, SFF by KMLockwood. Bookmark the permalink. Oooo, I didn’t know they were doing a tour! Hope they come south! I believe they’re coming to that London. I love to get the people who’d like that sort of thing to read that sort of thing.